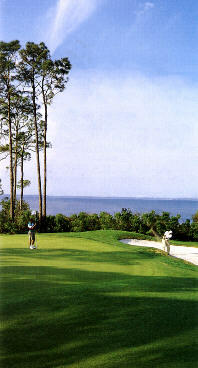 Gulf Coast visitors enjoy outstanding golf all year long in and around Destin. Picture yourself awakening to the soothing sounds of the Gulf and then playing some of the south's finest fairways to test your skills. From the crystal white sands of the world's most beautiful beaches, to the scornful sands of the greenside bunkers, your golf outing is sure to be both challenging and relaxing. Come on down and enjoy some of America's greatest golf values, in Destin Florida. Destin, FL. 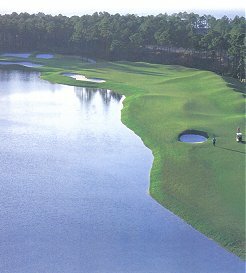 - this Fred Couples signature course offers one of the Gulf Coast's most challenging and unique golf experiences. Eleven lakes, picturesque wetlands, lush tree stands and the Choctawatchee Bay provide the backdrop for an outstanding example of nature and golf in perfect harmony. See the directory below for directions and contact information. Conveniently located on Hwy. 98 just 2 miles east of the new Mid Bay Bridge in Destin, Florida. 10 minutes from Fort Walton Beach; 55 minutes from Pensacola; 30 minutes from Panama City Beach. Located on Hwy 98 just 1 mile east of the new Mid Bay Bridge in Destin, Florida. 15 minutes from Ft. Walton Beach; 55 minutes from Pensacola; 30 minutes from Panama City Beach. 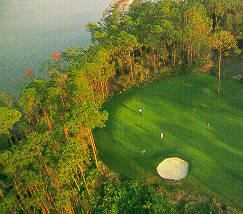 Kelly Plantation Golf Club is conveniently located on Hwy 98, just west of the new Mid Bay Bridge in Destin, Florida. From Hwy 98 in Destin take the Mid Bay Bridge north to Hwy 20, turn left. From I-10, take Hwy. 85 south to Niceville, turn left at Hwy. 20 Entrance approximately 5 miles on right. From I-10 take exit 10 (Hwy 87) south. Go app. 20 miles to State Road 399, turn right. Entrance 3 miles on left. From Hwy. 98, turn north on Sunrise Drive (Holly by the Sea subdivision). Follow the signs. From Hwy 98 take Hwy 85 North 4 miles to the Shalimar Bridge. Cross the bridge and go the 2nd light (Old Ferry Rd), turn right and take the 1st left (Megis Drive) follow signs apprx. 1 mile to Lake Lorraine Subdivision. From Highway 98 in Destin, take Airport Road north approximately 1/4 mile. Entrance on right. Traveling east, 3 miles past Sandestin, turn right on Scenic Hwy. 30A, 2.3 miles to Allen Loop Drive, turn left. go to golf Club Drive, turn left. follow signs to club house. From Panama City Beach, 18 miles from Philips Inlet Bridge, turn left on county Road 393 to the Gulf, turn right on Scenic Hwy. 30A, approximately 1 mile, right on Allen Loop Drive, then right on golf club Drive. Follow the signs to the club house. Holiday Golf Club: Just off Beaches Pkwy. (Hwy. 98) 5 miles west of the Hathaway bridge. From Destin only 6 miles east of the Phillips Inlet Bridge.